Posted on Mon, Jan 16, 2012 : 9:24 a.m.
Tonight's recipe provides a quick, easy way to make a creamy pasta sauce. I reserved a 1/4 cup of pasta water after the pasta was cooked, then ladled it right from the pot and into the sauce. The water contains starch and flavor and helps the pasta adhere to the sauce when they are tossed together. Combining the hot water with soft, creamy goat cheese makes a delicious, practically instant, pasta sauce. The recipe calls for cooked shrimp, which I had on hand. 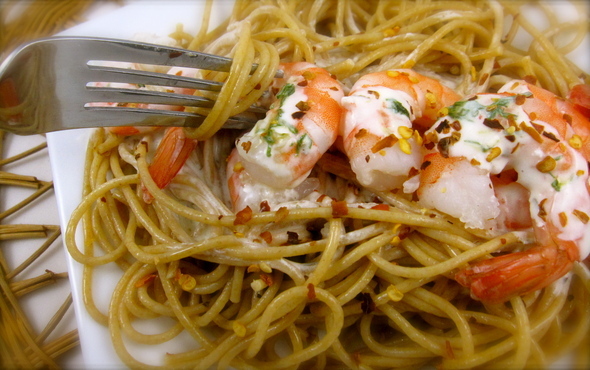 It wouldn't be a big deal to stir fry raw shrimp in olive oil before making the sauce. 2. Meanwhile, in a sauté pan, heat olive oil over medium-low heat. Add garlic and sauté 1 minute. 3. Crumble goat cheese into pan, and, with a fork, mash into the garlic and oil. Then add reserved hot pasta water. Combine pasta water and goat cheese and whisk until smooth. Stir in tarragon and shrimp and heat; season to taste with kosher salt and red pepper flakes. Serve over pasta.